The concept of running-on-the-banks-as-politics is not an innovation of Occupy Wall Street but rather of certified One Percenter, Arianna Huffington. Her "Move Your Money" plan was hatched in December of 2009 over a dinner conversation with some friends. The idea, which she describes as arriving in "a lightbulb moment," differs from the kind of idea you have before you stumble over to the 7-11 in a haze and buy a bag of Funyuns, an Entenmann's Danish, and a Big Gulp of Mountain Dew only to the extent that she actually went through with it. "The idea is simple," she says. If enough people who have money in one of the Big Six banks (the four we mentioned earlier, plus Goldman Sachs and Morgan Stanley) move it into smaller, more local, more traditional community banks, then collectively we, the people, will have taken a big step toward re-rigging the financial system so it becomes again the productive, stable engine for growth it's meant to be. Let's accept for a moment that by the sheer force of Arianna Huffington's persuasiveness, a significant number of Americans were convinced to move their money into smaller, more local banks and credit unions. Problem solved, right? Of course not. As Doug Henwood of Left Business Observer astutely notes, "small and local" should not be used interchangeably with "good." Small banks and credit unions must do something with the excess money that they cannot profitably invest locally. And that "something" is lending the money to one of the Big Six banks. Think of the message it will send to Wall Street -- and to the White House. That we have had enough of the high-flying, no-limits-casino banking culture that continues to dominate Wall Street and Capitol Hill. That we won't wait on Washington to act, because we know that Washington has, in fact, been a part of the problem from the start. Washington can't be expected to act, so vote with your wallets! It's fundamentally bourgeois because it imagines political change resulting from the choices of individual consumers as opposed to class-based collective activity. It's fundamentally bourgeois because it takes what is a systemic political problem and posits lifestyle decisions (in this case, personal finance choices) as effective resistance. It is important to draw a distinction between this and boycotts that are tethered to union organizing drives or other broad-based political organizing efforts. 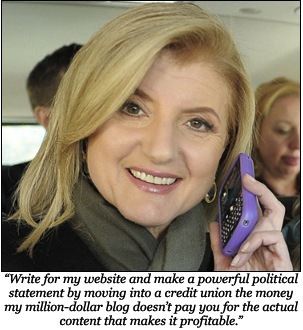 Finally, Huffington's statement evinces a deep cynicism with respect to politics in general. Of course Washington won't act without being prompted, but that doesn't mean that progressive legislative reforms aren't durable gains worth pursuing. While true systemic change might not be possible at the moment, a good step toward curbing the casino banking culture that Huffington laments would be organizing a political movement that can force Congress to reinstate Glass-Steagall, for starters. To the credit of the occupiers, they have attempted to think of the problem in systemic terms, and the call to reinstate Glass-Steagall has been one of the many raised, but for a vocal core of participants, the actions of those 24 protesters arrested in the Citibank flow logically from their commitment to "lifestyle politics." "[D]emonstrators are not simply camping out to ask the corporate government for legislation, they are creating the change they desire; creating a democracy that is direct and representative of all members of the 99 percent," gushes Alternet's Kristen Gwynne in her report from Zuccotti park. People are living, and thriving, in the space. Using donations, demonstrators have set up their own society, with free books, food and (minimal) health care. When I slept there Sunday night, I found I had almost everything I needed to survive. There was plenty of food -- baked ziti, fruit and cookies -- laid out in the buffet-style line. Between meals and late at night, there is always something to munch on, usually healthy foods like apples and bananas. If you've spent any amount of time at your local occupation zone—particularly in a bigger city—you have likely dropped in on one of the daily "General Assemblies" where such important matters as the location of the encampment Port-o-Potty are hashed out in painstaking detail, with full respect for the fetishized notion of direct democracy that permeates the movement. At one General Assembly of Occupy Philly, 45 minutes were spent discussing whether there would be a designated "smoke free/sober zone" at the occupation and, if so, what its boundaries would be. I don't know what the outcome of the discussion was, because I got bored and left before it was over. I've noticed a stark divide between Occupy participants. On one side are those who understand the demonstrations to be a means to the end of broader societal transformation. On the other side are those to whom the occupied zones are ends in themselves. To these people, the encampments "prefigure" a new society; an old IWW saying, "Building a new world in the shell of the old," is common among this cohort. Another of their favorite aphorisms is Gandhi's, "Be the change you want to see in the world" (as the above quote shows), which captures the essence of these occupiers' lifestyle politics quite neatly. Rather than viewing the challenge to the capitalist order as a matter of politics, they see it as a matter of changing the way they live. And once you accept that the makeshift society is the movement, concerns about maintaining the society—things like where the Port-o-Potty will go and where you can and can't be drunk—take precedence over outward strategic concerns. Like all utopian experiments, there are two main problems with this. First, because exponents of this project are not primarily interested in doing political organizing, its participants remain self-selecting and, thus, the movement is ultimately self-limiting. The only recruitment tool that this allows for is a vague moral plea, and moralism is an historically inert method for galvanizing the type of constituency that would be needed to alter the distribution of wealth and power in America. Second, it leaves the broader social order essentially intact. Indeed, capital is perfectly happy to let individuals "opt out" of the system here and there so long as the system can continue to operate unabated. Everyone from Robert Owen to the Icarians to generation after generation of kibbutznik can attest to that. Perhaps the most damning development on this front is the news that Viacom property MTV is planning to cash in on Occupy fever. On October 19, CBS News reported that MTV is looking for OWS participants to apply for its long-running reality show The Real World. Then, on October 24, MTV revealed that they would be airing True Life: I'm Occupying Wall Street on November 5. On its face, it might not make much sense to you. This is a network that includes on its roster the drunken escapades of Jersey Shore guidos, the lavish sweet sixteen parties of the entitled progeny of America's opulent, and a show that allows teenagers to be "made" into something for which they have no talent. What interest could they possibly have in OWS? But insofar as MTV's central project is portraying and cultivating the "lifestyle choices" (with a special emphasis on consumption patterns) of the 13-25 age demographic, and insofar as OWS is seen by some as a particular lifestyle choice made by members of this same age demographic, it actually makes quite a bit of sense. A cursory glance at the list of past True Life episodes turns up titles like True Life: I'm a Gamer, True Life: I'm a Street Racer, True Life: I'm a Textaholic, True Life: I'm a Fanboy, and the hyper-meta True Life: I Live Another Life On the Web. For more than a decade, the show has served as a virtual smorgasbord of lifestyle choices available to MTV's coveted demographic. What ties the individuals documented in each of these episodes together is that they are identified on the basis of what they do with their free time and what they do or don't spend their money on. Many OWSers—and, unfortunately, many on the left in general—take these same kinds of personal lifestyle preferences and imbue them with political significance. It's not people taking their money and burying it under their mattress. It's shifting the money to a company people respect the practices of. It's like, if you don't like Wal-Mart's practices, shopping at a local grocery store instead. It's a sad statement on the total ideological triumph of neoliberalism when exercising the only power neoliberalism has to offer you—your power as a consumer—is trumpeted as resistance. A more just and more equal society cannot be realized simply by choosing to buy different pieces of flair. Creating a tent-utopia might make you feel better about yourself, but it is utterly irrelevant to the political struggle against neoliberal imperatives. Capitalism swirls around us—not only materially but culturally. The grasp of lifestyle politics on leftwing thought and action has only tightened in the years since the publication of Bookchin's essay. Aided by the decline of a well-organized anti-capitalist left, it has now become one of the few modes through which isolated self-identifying leftists feel they can express themselves politically. At a moment when the widening wealth disparity in this country couldn't be more glaring, perhaps it’s time to completely purge from our politics the narcissistic fantasy that the personal choices you make about how to live your daily life are anything more than that. Eric Augenbraun is a freelance writer and blogger based in Philadelphia. His work appears occasionally in The Guardian and Philadelphia Weekly. He also blogs about baseball at The Good Phight and NotGraphs. You can follow him on Twitter.